I have always loved spring rolls. So light and so many possibilities. Asian food is my favorite style of cooking. If you have read my recipe index, you probably would have guessed that. Probably because most of the meals are quick and easy. I always thought that spring rolls were hard to make. The truth is, they are actually pretty easy. It took about 2 rolls and I had it down. One thing to know is, these are best eaten immediately. So we only made what we planned on eating. The rice paper should keep for quite some time in the packaging. You can really add whatever you want to them. Here is what we added. Oh these look so delicious. 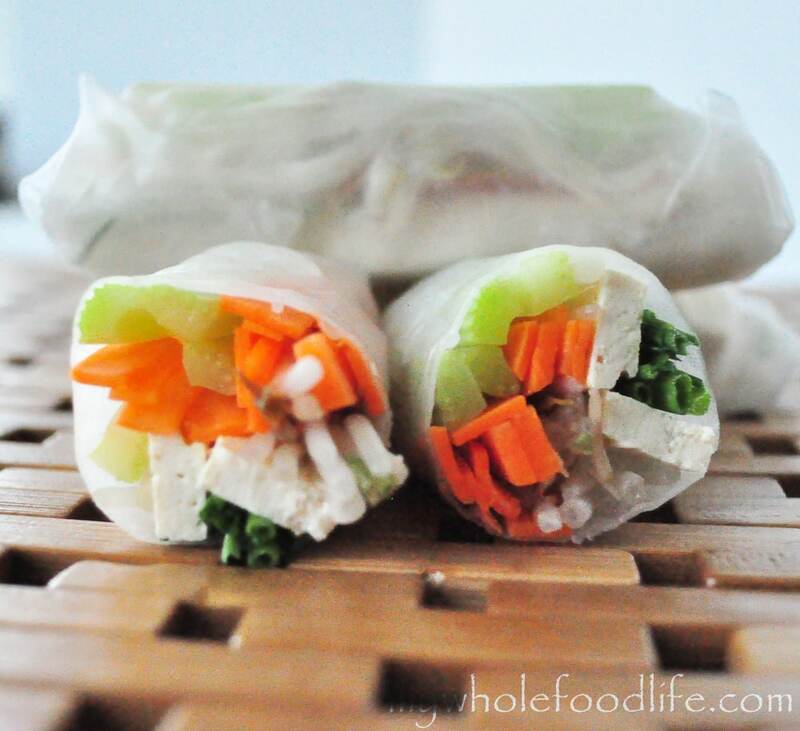 We love Spring rolls so I look forward to trying these. Thanks! We love spring rolls too! I've been wanting to make my own spring rolls forever. Thank you for posting this!!! Sure! Hope you like them! Your spring rolls look great. I also love spring rolls and made some that only had vegetables in them not too long ago and they were great. I always like to add sprouts to mine. What would happen if you cooked these? I have never made any and have never used rice paper rolls, so I am unfamiliar with them. Would you bake them? I have never baked mine. The packaging says something about deep frying them for a minute or two, but nothing about baking. If I was going ton do baked rolls, I would probably by egg roll wraps which are more doughy. where do you purchase rice paper rolls? We got ours at Whole Foods. They were in the section with all the Asian food. You should try it with brown rice wrappers next time. I know. My husband picked up the ones I used in this recipe. Do you think I can find brown rice wrappers at Whole Foods? I signed up with you page. I thought spring rolls were hard to make too! I still haven't tried -- none of our local grocery stores stock the rice paper -- but it's at the top of my "Foods to Make" list. I love all of the bright colors from the fresh vegetables in yours! They are so easy! I hope you enjoy mine if you try them. I love how you can fill them with anything you want. I love that they're so versatile too! You could also use shredded lettuce or spring mix in place of cabbage, and add boiled shrimp (whole or halved), or beef teriyaki. If you add meat or shrimp, your rolls will taste better with mint leaves, basil, and chinese cilantro I sometime use rice paper for egg rolls (as most vietnamese restaurants do) but i prefer the egg roll wrappers, as i find rice rice paper sticks to my teeth when chew. Thanks for the tip. I have plans for an egg roll recipe in the future and I will make sure to buy the egg roll wrappers. I just read the "about you" page and see that you're a vegan, and i just want to apologize if i offended you with my suggestion. A Japanese mandoline is great for quick shredding. ;) I bought one at our local Asian Food Market for a couple of dollars. Funny you say that. We have a mandoline, but we didin't think to use it for shredding. I normally use it to make potato chips. You can omit that if you want. Tofu is a vegetarian protein made with soybeans. You can also use shrimp or chicken if it suits you. Yummy! Can't wait to try these. I love all your recipes. I'm vegetarian and I don't like tofu. Any suggestions for a protein substitute.? You can just fill them with fresh veggies.